An original Spanish-style home with all the charm of classic beach living! This relaxed beachfront retreat is loaded with charm and perfectly situated to enjoy beach living at its very best. Classic details, hardwood floors and panoramic views are enjoyed throughout. A beachfront patio and upper level view deck allow for front-and-center enjoyment of the near-perfect SoCal weather. Main level living areas include, kitchen, den, formal dining, an expansive living room, two bedrooms, a full bath, and a powder room/laundry. 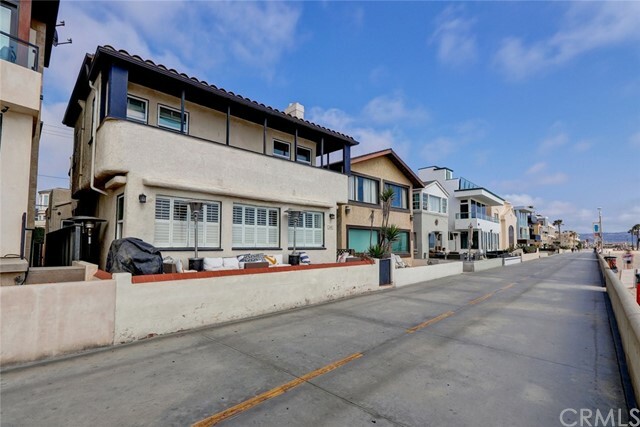 French doors off the rear of the house allow for access by way of a gated entry by the detached 2 car garage facing Beach Dr. A private, sunny courtyard features a beach shower, perfect for rinsing off after a great morning surf session. 3 addt&apos;l bedrooms are on the upper level. The ocean view master bedroom suite has an en-suite bath. built-in vanity, dual closets, and ceiling fan. An additional ocean view bedroom with built in vanity connects to a large 3rd bedroom by way of a Jack and Jill bath. The 3rd bedroom captures fantastic ocean breezes from the large, covered rear deck. Enjoy the community feel of living on The Strand while spending evenings watching the sunset with family and friends from a coveted vantage point. Your backyard is the beach! Surf, play a game of volleyball or enjoy biking, walking or jogging on The Strand to neighboring beach communities. Stroll into downtown Hermosa to enjoy dining, nightlife, shopping and community events.